This is going around, and it's fun so I couldn't pass it up! I was tagged by Let them have Polish! & Lacquer Ware of Tips and Toes. Thanks ladies! I realized how inconsistent my handwriting is compared to other people who have done this tag. If anyone would like to do this please go ahead! We have the same tastes in oldies! You're left handed? So awesome! I'm right dominant but taught myself to write with my left hand before I came to uni (somehow, this seemed like a productive way to spend my summer... Ihavenofriends). 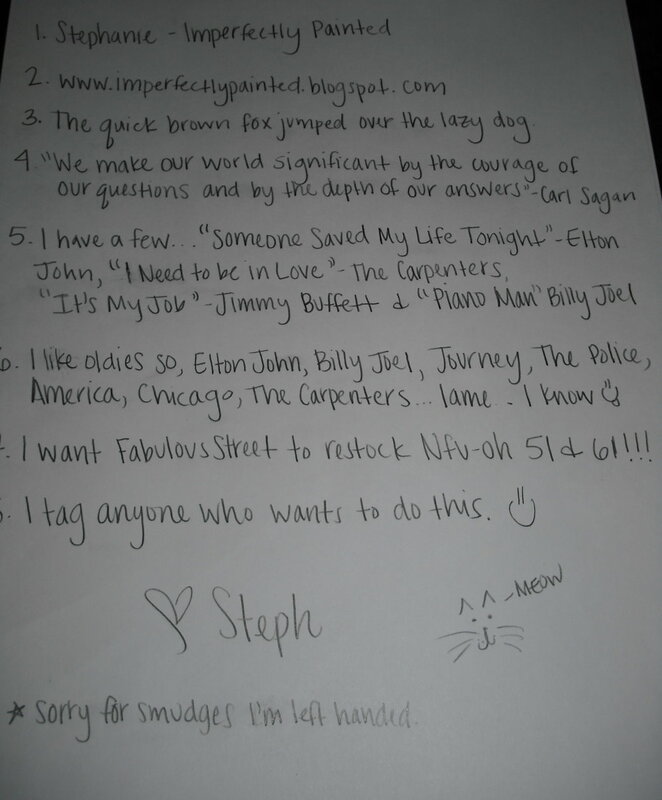 High five for having multiple writing personalities, mine is clearly the messiest one out there! I LOVE Elton John and Billy Joel too! They are my favs. :-) Have you ever been to one of their concerts? I've been to three of them and they are amazing! ahhh i want them to restock too!!!!! they emailed me back saying april! im feeening for 51 and 61!!!! !